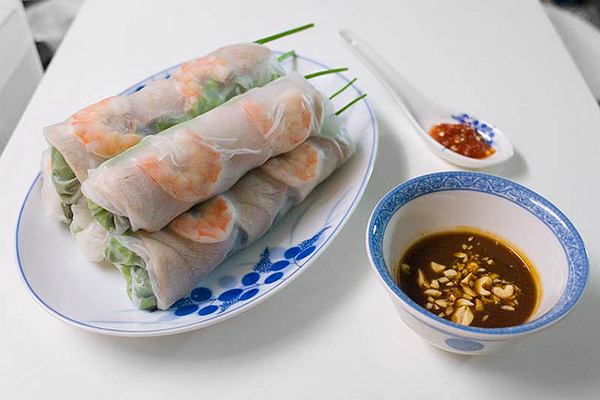 This traditional Vietnamese Spring Roll recipe (gỏi cuốn) is a fresh and healthy recipe, full of veggies, lean meat, and shrimp so you can chow down with less guilt :). 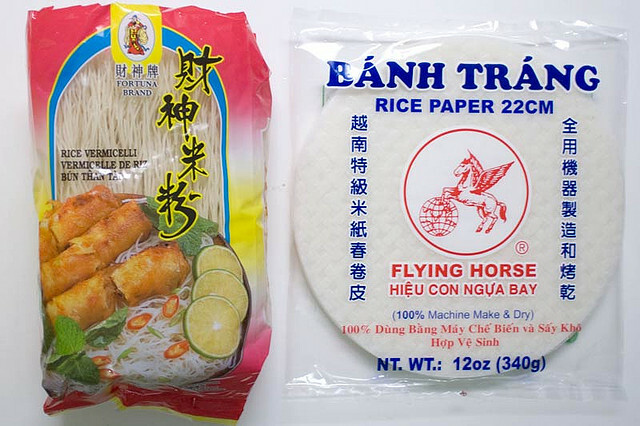 Made from just rice and water, the rice paper (bánh tráng) could be easily used for lots of other things. 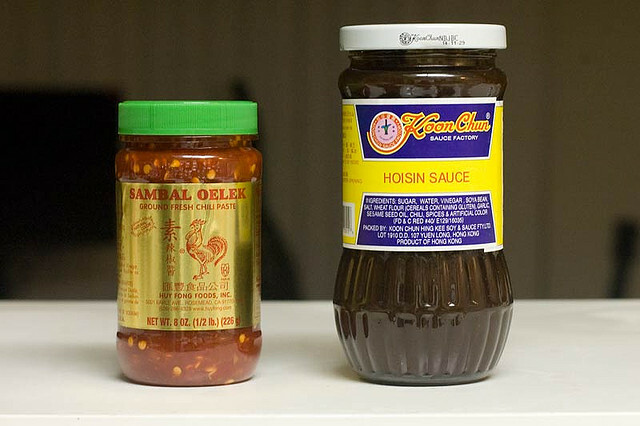 At one Vietnamese market, over five brands of this stuff. All with multi-lingual packaging: Vietnamese, Chinese, English, and French. Bánh tráng gets around. 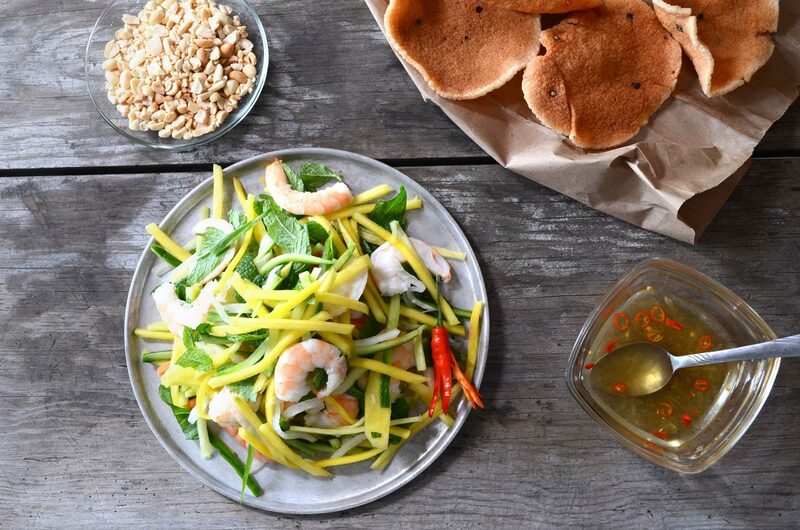 Cambodians have a similar roll made of the same rice paper called nime chow–it’s a meatless version dipped in a vinegar-based sauce instead of hoisin. The Chinese have a version with duck and cucumber with a hoisin based dipping sauce. Japanese restaurants are also commonly using regular and dyed versions of rice paper for rolls too. For the meat, use any cut of pork you wish, but leaner works better. 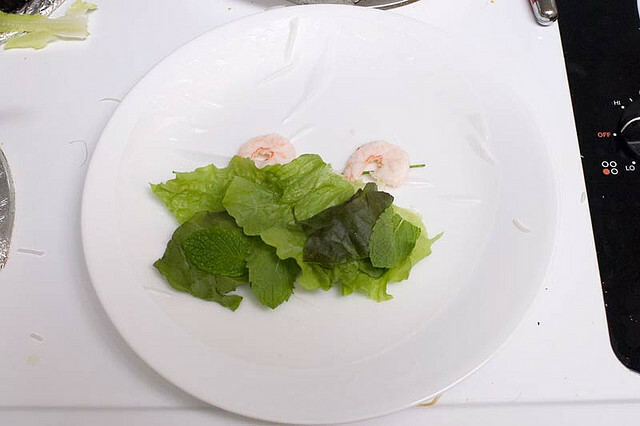 The shrimp can also be any size but a medium one helps make rolling easier. 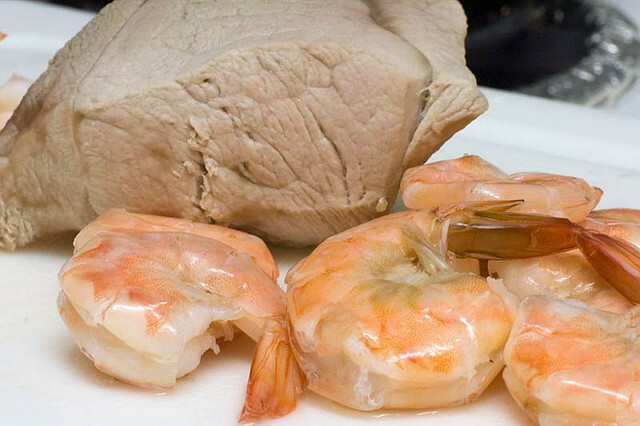 If your shrimp is frozen, thaw it in a bowl of water until it is defrosted so you can cut into them. Split and devein the shrimp. Most Viet folks don’t care about deveining but I DO! It helps to devein using a sharp knife and a steady hand. I had to pull up a chair to get the hang of this. I also found it helpful to have a bowl of water nearby to rinse them. Cook the pork: fill a small pot with water about 1.5 inches above the pork, add 1 teaspoon salt and 1 teaspoon sugar. Bring to a boil on high heat then lower to 60% for about 30 minutes. It is done when it floats or when it is no longer pink in the middle. Cook the shrimp: fill a small pot with about 2 inches of water (just enough to cover the shrimp). Add 1/2 teaspoon salt and bring to a boil. Add the shrimp. Boil for about 1.5-2.5 minutes on 70% heat until the shrimp is no longer translucent in the middle. It will be quick so don’t go anywhere! 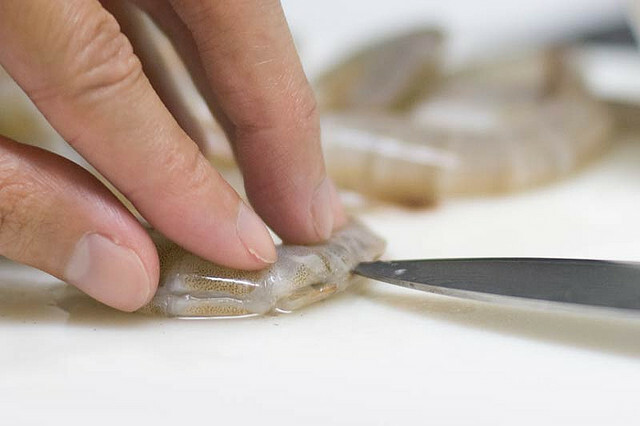 Remove the shells and tails and clean off any remaining shrimp intestine. Split the shrimp in half along the body. 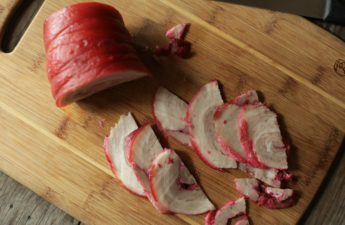 Try to picture how you want to layer the pork inside the roll so you know how to cut it. Slice as thinly as porkly possible so rolling will be easier. Get 1 gallon of water boiling. Add 1/3 of the rice vermicelli package and boil for 8 minutes (following the instructions on the packet). Drain and cool the noodles under cold running water to stop it from cooking. 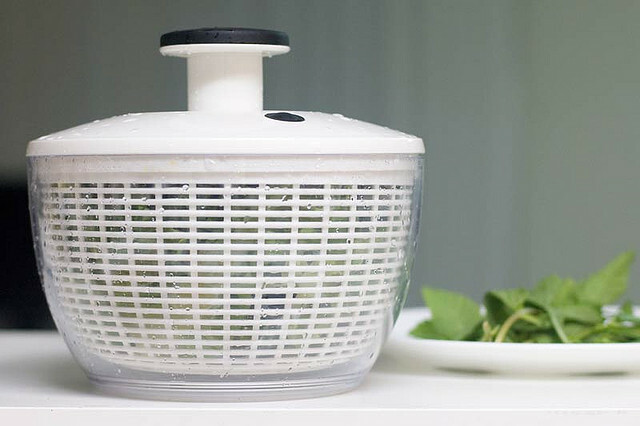 Wash and dry your veggies! I used an OXO Salad Spinner . 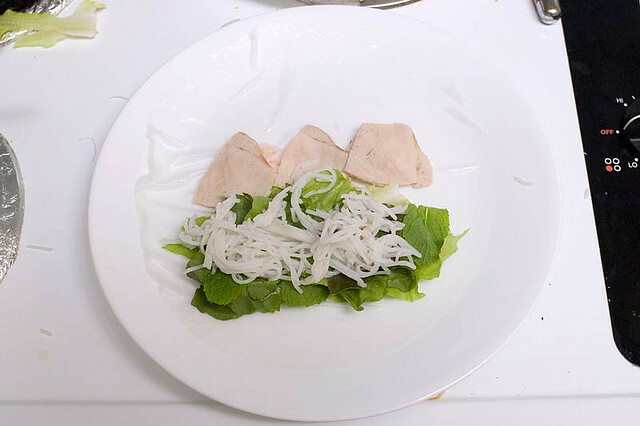 Add some warm water to a plate to dip the rice paper in. Dip only before making each roll. It took me about 5-10 seconds of soak. Make sure to remove it before it gets to the desired softness so it’s easier to handle. 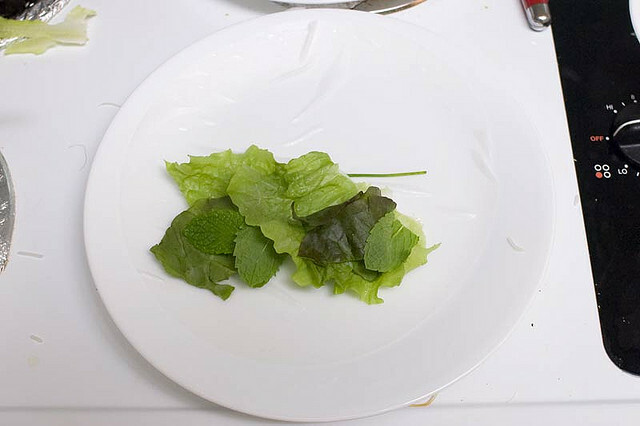 Add some lettuce near the bottom and leave about 1″ to 1.5″ space on the sides. Layer with some mint and some chives. Add shrimp near the middle, color side down. Add pork on top of the shrimp and some noodles on top of the vegetables. Make sure it’s spread evenly across. Fold the sides in so its snug and add some more chives. 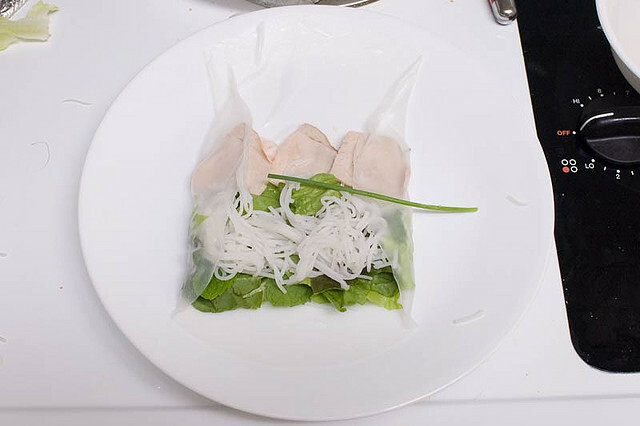 Then fold the bottom up to cover the rice noodles. 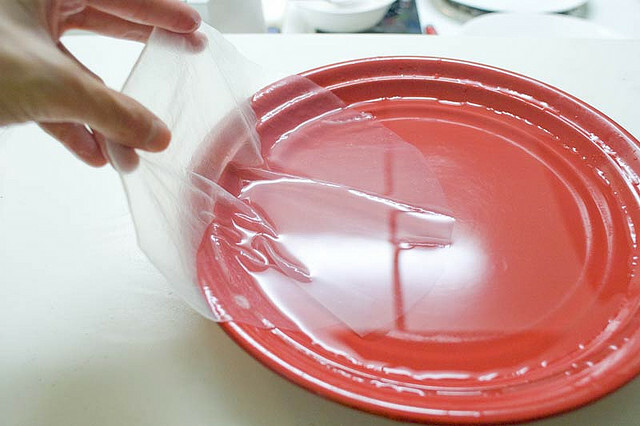 You want to keep the roll tight, so lightly squeeze it together as you roll. Once you reach the meat, ease up on the tightness so it doesn’t tear. This recipe makes about 10 Spring Rolls. Bring to boil, and then immediately turn off the heat. Serve. Leave the sambal chile paste on the side so others can add to their own dipping bowl as needed. Rachel: Yeah! I also didn’t think it would be so simple. It kinda reminds me of Hu Tieu: rice noodles, pork, shrimp, and you dip the meat in hot sauce and hoisin sauce. 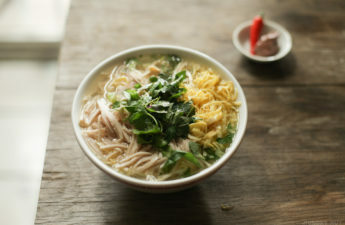 Thanks so much for the informative post – the photo essay makes me feel like even I could do this! I had no idea that the sauce that so often comes with goi cuon was only thinned out hoisin garnished with nuts and sambal! That rules. Hey Rachel, I’ve updated the recipe for the sauce which is a bit more complicated, but way better now! ohh these look delicious. my dad likes using the hot plate with butter. ill try boiling them next time. Try Amazon.com. A bit pricey, but it leaves the lettuce bone-dry! I could never roll the spring roll correctly. It always comes out bulky. Your step by step pictures is really simple to follow. I’ll try it to see if my rolls come out right next time. Nice post! Thanks! It took me a few rolls to get it down. At first there was way too much filling. Eat the first one you make to get a feel for how much of each ingredient you want in the roll. My mom mixes the hoisin sauce with some peanut butter and warms it a bit on the stove. Mmm~! Thanks for the tip! That’s tasty too. I’m going to make some more tonight. Hey Huy! Love this recipe and I have made it once already & planning to make it again tonight! 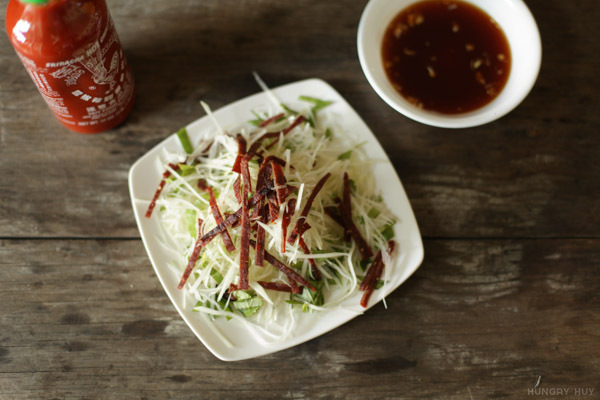 Its a staple at my house to each fresh spring roll once a week, so easy & yummy! thanks for the share!! Interesting. My rolling technique is a bit different but I will give yours a try. I make my rolls with pork that has been pounded almost paper thin and then braised with a barbeque sauce, if I use pork or chicken at all. Also, I never add heat to my hoisin/peanut based sauce. 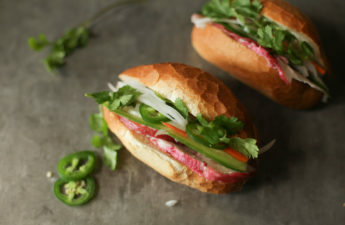 I may add a few pepper flakes with the chilled fish sauce that I also serve my rolls with but never the dark. Thank you for your recipe. I really like the step by step photos. It makes it so easy for individuals who have never made a dish before to understand the preparation. 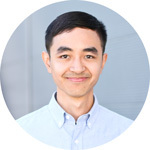 Thanks for sharing this Huy! 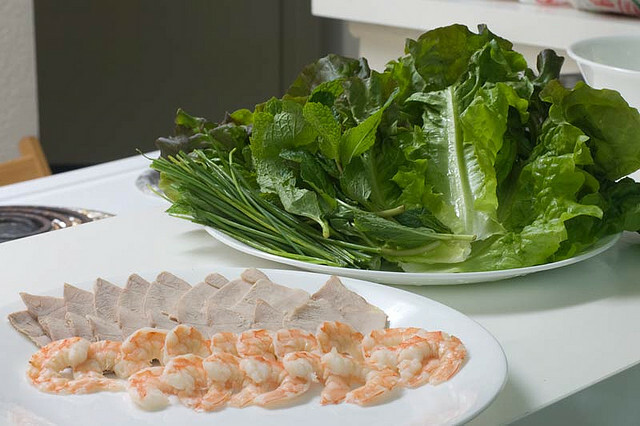 I went and bought a pack of the rice paper a week or so ago after having twice enjoyed “summer rolls” recently. I googled cuon because that’s all the clues they have on the packet. I was afraid to do the soaking wrong. I was thinking to improvise anyway, but how lovely to come across your well-written, photo-illustrated post. Now I’m confident I’ll be able to make these even though my first batch is going to be not at all authentic because I am missing some ingredients that I think would make them better. However, I’m going to give the techniques and general idea a whirl and get more things in my next supermarket trip! Thanks for stopping by! Don’t be afraid to do it wrong–I mess things up all the time :). The rice sheets are fairly cheap. Start out with water that isn’t too hot so you can adjust the softness with soak time more easily. Thank you for your posting, the photos and etc. 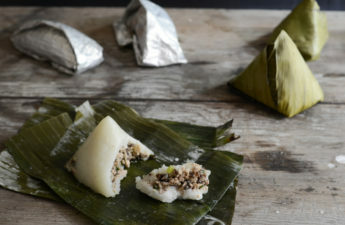 I plan to have a make it yourself goi cuon party and came across your site. Thank you! Looks like a great recipe. I see that in the pictures you have chili paste, but it doesn’t seem to be in the recipe. Are you supposed to add a little to the dipping sauce? Hey Christina, the chile paste is optional and I leave it out so each person who eats from it can add as much or as little as they like. But I’ll note that in the recipe, thanks! Hey Huy, If you you squeeze half of lime juice or lemon to the warm water that will keep the spring roll last a bit longer . The moist will remain with the roll instill the end of the day. Thanks for the tip Larry!